Example from MIL-HDBK-881, which illustrates the first three levels of a typical aircraft system. A work-breakdown structure (WBS) in project management and systems engineering, is a deliverable-oriented breakdown of a project into smaller components. A work breakdown structure is a key project deliverable that organizes the team's work into manageable sections. The Project Management Body of Knowledge (PMBOK 5) defines the work-breakdown structure "A hierarchical decomposition of the total scope of work to be carried out by the project team to accomplish the project objectives and create the required deliverables." A work-breakdown structure element may be a product, data, service, or any combination thereof. A WBS also provides the necessary framework for detailed cost estimating and control along with providing guidance for schedule development and control. WBS is a hierarchical and incremental decomposition of the project into phases, deliverables and work packages. It is a tree structure, which shows a subdivision of effort required to achieve an objective; for example a program, project, and contract. 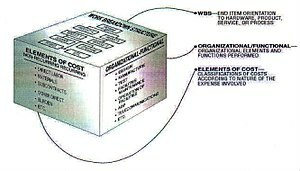 In a project or contract, the WBS is developed by starting with the end objective and successively subdividing it into manageable components in terms of size, duration, and responsibility (e.g., systems, subsystems, components, tasks, subtasks, and work packages) which include all steps necessary to achieve the objective. Example of work breakdown structure applied in a NASA reporting structure. The work breakdown structure provides a common framework for the natural development of the overall planning and control of a contract and is the basis for dividing work into definable increments from which the statement of work can be developed and technical, schedule, cost, and labor hour reporting can be established. A work breakdown structure permits summing of subordinate costs for tasks, materials, etc., into their successively higher level "parent" tasks, materials, etc. For each element of the work breakdown structure, a description of the task to be performed is generated. This technique (sometimes called a system breakdown structure) is used to define and organize the total scope of a project. The WBS is organized around the primary products of the project (or planned outcomes) instead of the work needed to produce the products (planned actions). Since the planned outcomes are the desired ends of the project, they form a relatively stable set of categories in which the costs of the planned actions needed to achieve them can be collected. A well-designed WBS makes it easy to assign each project activity to one and only one terminal element of the WBS. In addition to its function in cost accounting, the WBS also helps map requirements from one level of system specification to another, for example, a cross reference matrix mapping functional requirements to high level or low level design documents. The WBS may be displayed horizontally in outline form, or vertically as a tree structure (like an organization chart). The development of the WBS normally occurs at the start of a project and precedes detailed project and task planning. The concept of work breakdown structure developed with the Program Evaluation and Review Technique (PERT) by the United States Department of Defense (DoD). PERT was introduced by the U.S. Navy in 1957 to support the development of its Polaris missile program. While the term "work breakdown structure" was not used, this first implementation of PERT did organize the tasks into product-oriented categories. 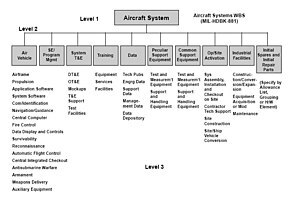 By June 1962, DoD, NASA and the aerospace industry published a document for the PERT/COST system which described the WBS approach. This guide was endorsed by the Secretary of Defense for adoption by all services. In 1968, the DoD issued "Work Breakdown Structures for Defense Materiel Items" (MIL-STD-881), a military standard requiring the use of work breakdown structures across the DoD. The document has been revised several times, most recently in 2018. The current version of this document can be found in "Work Breakdown Structures for Defense Material Items" (MIL-STD-881D). It includes WBS definitions for specific defense materiel commodity systems, and addresses WBS elements that are common to all systems. The common elements identified in MIL-STD-881D, Appendix K are: Integration, assembly, test, and checkout; Systems engineering; Program management; System test and evaluation; Data; Peculiar support equipment; Common support equipment; Operational/Site activation; Contractor Logistics Support; Industrial facilities; Initial spares and repair parts. The standard also includes additional common elements unique to Space Systems, Launch Vehicle Systems, and Strategic Missile Systems. In 1987, the Project Management Institute (PMI) documented the expansion of these techniques across non-defense organizations. The Project Management Body of Knowledge (PMBOK) Guide provides an overview of the WBS concept, while the "Practice Standard for Work Breakdown Structures" is comparable to the DoD standard, but is intended for more general application. The 100% rule states that the WBS includes 100% of the work defined by the project scope and captures all deliverables – internal, external, interim – in terms of the work to be completed, including project management. The 100% rule is one of the most important principles guiding the development, decomposition and evaluation of the WBS. The rule applies at all levels within the hierarchy: the sum of the work at the "child" level must equal 100% of the work represented by the "parent" and the WBS should not include any work that falls outside the actual scope of the project, that is, it cannot include more than 100% of the work… It is important to remember that the 100% rule also applies to the activity level. The work represented by the activities in each work package must add up to 100% of the work necessary to complete the work package. Mutually exclusive: In addition to the 100% rule, it is important that there is no overlap in scope definition between different elements of a work breakdown structure. This ambiguity could result in duplicated work or miscommunications about responsibility and authority. Such overlap could also cause confusion regarding project cost accounting. If the WBS element names are ambiguous, a WBS dictionary can help clarify the distinctions between WBS elements. The WBS Dictionary describes each component of the WBS with milestones, deliverables, activities, scope, and sometimes dates, resources, costs, quality. If the work breakdown structure designer attempts to capture any action-oriented details in the WBS, the designer will likely include either too many actions or too few actions. Too many actions will exceed 100% of the parent's scope and too few will fall short of 100% of the parent's scope. The best way to adhere to the 100% rule is to define WBS elements in terms of outcomes or results, not actions. This also ensures that the WBS is not overly prescriptive of methods, allowing for greater ingenuity and creative thinking on the part of the project participants. For new product development projects, the most common technique to ensure an outcome-oriented WBS is to use a product breakdown structure. Feature-driven software projects may use a similar technique which is to employ a feature breakdown structure. When a project provides professional services, a common technique is to capture all planned deliverables to create a deliverable-oriented WBS. Work breakdown structures that subdivide work by project phases (e.g. preliminary design phase, critical design phase) must ensure that phases are clearly separated by a deliverable also used in defining entry and exit criteria (e.g. an approved preliminary or critical design review). One must decide when to stop dividing work into smaller elements. This will assist in determining the duration of activities necessary to produce a deliverable defined by the WBS. There are several heuristics or "rules of thumb" used when determining the appropriate duration of an activity or group of activities necessary to produce a specific deliverable defined by the WBS. The first is the "80 hour rule" which means that no single activity or group of activities at the lowest level of detail of the WBS to produce a single deliverable should be more than 80 hours of effort. The second rule of thumb is that no activity or group of activities at the lowest level of detail of the WBS should be longer than a single reporting period. Thus if the project team is reporting progress monthly, then no single activity or series of activities should be longer than one month long. The last heuristic is the "if it makes sense" rule. Applying this rule of thumb, one can apply "common sense" when creating the duration of a single activity or group of activities necessary to produce a deliverable defined by the WBS. forms a unique package of work which can be outsourced or contracted out. It is common for work breakdown structure elements to be numbered sequentially to reveal the hierarchical structure. The purpose for the numbering is to provide a consistent approach to identifying and managing the WBS across like systems regardless of vendor or service. For example, 1.1.2 Propulsion (in the example below) identifies this item as a Level 3 WBS element, since there are three numbers separated by a decimal point. A coding scheme also helps WBS elements to be recognized in any written context and allows for mapping to the WBS Dictionary. The lowest element in a tree structure, a terminal element is one that is not further subdivided. In a Work Breakdown Structure such elements (activity or deliverable), also known as work packages, are the items that are estimated in terms of resource requirements, budget and duration; linked by dependencies; and scheduled. At the juncture of the WBS element and organization unit, control accounts and work packages are established and performance is planned, measured, recorded and controlled. A WBS can be expressed down to any level of interest. Three levels are the minimum recommended, with additional levels for and only for items of high cost or high risk, and two levels of detail at cases such as systems engineering or program management, with the standard showing examples of WBS with varying depth such as software development at points going to 5 levels or fire-control system to 7 levels. The higher WBS structure should be consistent to whatever norms or template mandates exist within the organization or domain. For example, shipbuilding for the U.S. Navy must respect that the nautical terms and their hierarchy structure put into MIL-STD are embedded in Naval Architecture and that matching Navy offices and procedures have been built to match this naval architecture structure, so any significant change of WBS element numbering or naming in the hierarchy would be unacceptable. The WBS construction technique employing the 100% rule during WBS construction. The figure on the left shows a work breakdown structure construction technique that demonstrates the 100% rule and the "progressive elaboration" technique. 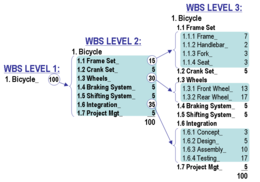 At WBS Level 1 it shows 100 units of work as the total scope of a project to design and build a custom bicycle. At WBS Level 2, the 100 units are divided into seven elements. The number of units allocated to each element of work can be based on effort or cost; it is not an estimate of task duration. The three largest elements of WBS Level 2 are further subdivided at Level 3. The two largest elements at Level 3 each represent only 17% of the total scope of the project. These larger elements could be further subdivided using the progressive elaboration technique described above. WBS design can be supported by software (e.g. a spreadsheet) to allow automatic rolling up of point values. Estimates of effort or cost can be developed through discussions among project team members. This collaborative technique builds greater insight into scope definitions, underlying assumptions, and consensus regarding the level of granularity required to manage the projects. ^ "Glossary of Defense Acquisition Acronyms and Terms: Contract Work Breakdown Structure (CWBS)". Defense Acquisition University. Retrieved 19 September 2017. ^ Booz, Allen & Hamilton Earned Value Management Tutorial Module 2: Work Breakdown Structure, Office of Science, Tools & Resources for Project Management, science.energy.gov. Accessed 27. Dec 2011. ^ a b c NASA (2001). NASA NPR 9501.2D. May 23, 2001. ^ Swiderski, Mark A., PMP workbreakdownstructure.com, PMBOK-Work Breakdown Structures. Accessed 16. June 2013. ^ Ashe, Kenneth, Work Breakdown Structure, Accessed 23. May 2016. ^ Gilmer, Thomas (1982-08-04). Introduction to Naval Architecture. pp. pg98. ISBN 9780870213182. This page was last edited on 2 April 2019, at 04:18 (UTC).